The joke in 1966’s Who’s Afraid of Virginia Woolf? is deeply ingrained in the small intricacies of wordplay and in ephemeral hand-gestures or sideways glances. So far buried this joke that what we mistake for plot is sad, onionic livelihood, ever unraveling from saneness to madness. What we watch is not what we see as alcohol metaphysically represents itself and its deep decline into an inebriated system of stories and layers so that this joke is simply not funny – it’s not sad either. The joke is carefully wrapped in itself, torturous and self-destructive and funny in the same way that Virginia Woolf herself straightforward. The lesson in Who’s Afraid of Virginia Woolf? is not about fear of feminism and instead about questioning the motives of fear in instance. The first joke is the set-up of the scene: George and Martha are too innocuous of names and the ludicrousness that a young couple would saunter home to them at half-two in the morning is absurd. We are to believe that these partiers, demure in nature and cruel in disguise, want to shindig throughout the evening with the most magnificent of boring. They, together, of course booze but some aspect of the scene is off. If not for the witty and rapturous dialogue, we might stop to ask: why is this happening? Where exists the humor in this evening or even a relative purpose? For whom is this entertaining? Surely the right move is to cut the scene off and move toward a more in-depth characterization of the innocuous couple; but no, here comes bright-eyed and waifish Nick and “Honey” to provide straight relief from the focal, rather cartoonish relationship. We are led to believe that George and Martha will use Nick and Honey as foil, a reflection of their joke of a relationship. This joke is off-centre in a way that offers another vital point to the story: why are these two together in the first place? Are we supposed to see glimmers of a past relationship reflected and magnified as the two couples drink more and juxtapose? We laugh at Honey over-drinking, but doesn’t Martha consistently over-drink and over-talk? We scoff at George’s meek attempts at typical masculinity but don’t we see Nick attempting dominance throughout the film? At various points in the film, the script is patently obvious at its attempts to expose reasoning for why this particular difficult relationship – the four-way – is unfolding. It’s the set-up for the big joke, the big reveal we all know is coming in the film’s denouement. Except it isn’t funny. Jokes have many sides and layers – the joker, the one telling the joke, holds power over language and tone, while the jokee, the one(s) receiving the language or image, has no control save two reactions, immediate and languished, in response to the particular effort offered. But there exists a third audience, those whose presence is unintended either accidentally or purposefully, but whose existence lies outside the complex joker/jokee relationship. This observer is audience and the reactions are uncontrolled and cannot be modified or altered; if the joke is not funny, it is patently obvious that the joke was not meant for them. This is the devastating premise of Who’s Afraid of Virginia Woolf? We are watching a joke that isn’t funny and wasn’t for us unfold. 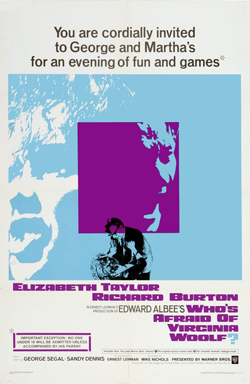 The original screenplay – play – written by Edward Albee differs somewhat from the movie, and subsequent adaptations, which have gotten more liberal in language and in theme over the decades as it is repurposed. Initial shock and awe after the first viewing rapidly declines and with each viewing in any format the details – so minute or so inconsequential in each previous run – exacerbate and the joke changes each time. Mike Nichols, in his capacity as director, charged Elizabeth Taylor with her most challenging but most complete role and honed Richard Burton to play gravity to her supernova. As key players in the film’s production, they were in on the joke. The Academy apparently were not as fortunate as they saw A Man For All Seasons as most worthy in 1966 against Alfie (too British), The Russians are Coming, The Russians are Coming (too obvious) and The Sand Pebbles (overdone). As it came down to the two candidates most worthy, those who would vote yay to Who’s Afraid of Virginia Woolf? must have been telling their own joke.